Plus, it’s the dead of chilly, chilly winter for many of us – we need these calories, right? We need them for warmth and comfort and sustenance and the pure gumption to get through the 15th consecutive dreary-weather day. I definitely appreciate a good salad, but I can’t subsist on salads alone at this time of year! This risotto can make even the most mundane and dreary of weeknights feel special. You may think of making risotto as a tedious, time-consuming process, but it’s not nearly as bad as you might think. All you should need is about an hour from start to finish. And while the process of cooking the risotto does require your near-constant attention (as you add ladlefuls of stock every five minutes to the pan, watch the rice absorb it, and stir as necessary), it’s really quite relaxing. I love to enjoy a glass of wine and a podcast or TV show as I stand watch and stir. Risotto, with its impressive reputation and decadent creaminess, also makes an excellent special occasion dish – great for date night, a birthday dinner, or any other occasion when you want to impress. The roasted sweet potatoes, toasted pine nuts, and fresh sage in this recipe give it an even more complex and delicious depth of flavor. Sautéed asparagus spears and a salad would pair well with it. If you saw my recent Classic Roasted Chicken post, you’ll know how beneficial I find having roasted chicken on hand. Pulled chicken from the bird I displayed in that post went into this risotto, and I had loads extra left. It’s been great to enjoy the chicken in several different forms; I hope you find it a helpful cooking hack as well if you decide to go the whole-chicken route. If not, one cooked boneless-skinless chicken breast should provide the requisite cup’s worth of pulled chicken (and likely extra). Some helpful risotto preparation tips: keep an eye on it during the stock-ladling stage and stir regularly but not excessively. You want to stir enough to prevent the risotto from burning or sticking to the bottom of the pan but not so much that the rice forms an overly sticky, gluey consistency. When in doubt: use your instincts and stir when you think you should. I believe it’s better to mix more than less. I stir the risotto every time I add a ladleful of stock to it and any other time it looks like it needs it. If you find the rice is really sticking to the bottom of the pan or is absorbing the stock too quickly, try decreasing the heat. Medium-low may be an ideal heat setting if your burners run hot, as mine do. Also, resist the urge to add in more than one ladleful of stock at a time; patience is key here! I’ve found that pouring in too much stock at once often translates to the rice not absorbing it properly and the process being thrown out of whack. Preheat the oven to 425 degrees. Put the cubed sweet potato in a large baking dish and drizzle with one tablespoon of the oil. Let roast for 20 minutes, or until softened. Once cooled, measure out one cup’s worth and set aside. Once you’ve got the sweet potatoes in the oven, add a second tablespoon of the oil, the onion, and the garlic to a large pot over medium heat; let sauté, stirring occasionally, for four to five minutes, until the onion has softened. Stir in the rice and let it toast for a minute or two before adding the white wine (add some wine to your glass while you’re at it!). Once the wine has evaporated after a few minutes and the rice has absorbed its lovely flavor, add the sage; then begin the process of adding in the stock. About every five minutes, add a ladleful of stock to the rice, allowing each ladle to absorb fully before adding the next one. This process should take about 35-45 minutes. Once the risotto has neared the end of its cooking process, add the remaining two teaspoons of oil and the pine nuts to a small pan over medium heat. Let cook for a minute or two until toasted. I find stirring nearly constantly during this process helps the pine nuts toast evenly and prevents them from burning (which is too easy of an occurrence). Once they’ve achieved a golden-brown glow, immediately remove them from heat. 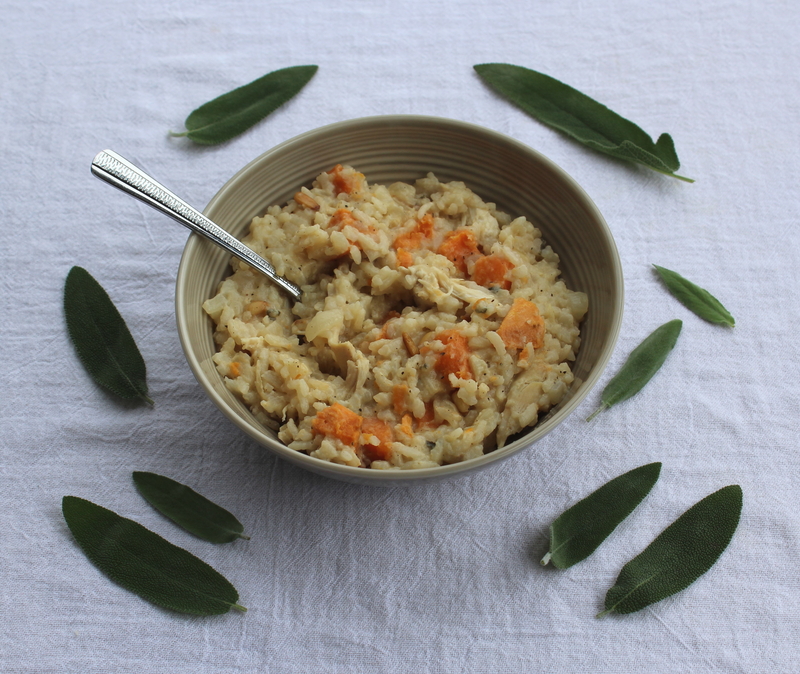 When all of the stock is gone and has been fully absorbed by the rice, you should be left with a risotto of a wonderfully creamy consistency (if the consistency is too thick, you can add more stock or even a small amount of water to help thin it). Stir in the Parmesan cheese, the pine nuts, the reserved cup of cubed sweet potato, and the pulled chicken. Season with salt and pepper to taste, and you’re done! Serve immediately to fully enjoy the creamy luxuriousness of fresh risotto. Makes about four to five servings.